This is a beautiful clean and well maintained boat. This boat has two 8.2 fuel injected MerCruiser engines.The cabin is well lit with seven port windows and three overhead hatches. This boat holds 10 people and sleeps 4 comfortably. All regular maintenance has been completed, and boat has been stored in heated storage since we have owned the boat. This boat has a great many features including ice maker in cockpit, built in vacuum system, under water swim platform lighting, a/c and heat, windlass and 150' chain, Sirus radio, emergency start system, new cabin flooring, all batteries (4) replaced 2017, new cockpit carpet 2017, salon windows installed in back canvas, new windows in front cockpit 2018, new Suzuki 4hp 2016, new Davit system 2016 for Walker Bay tender, new impeller for 5kw Westerbeke generator, and new flat screen tv. All zincs replaced 2019. 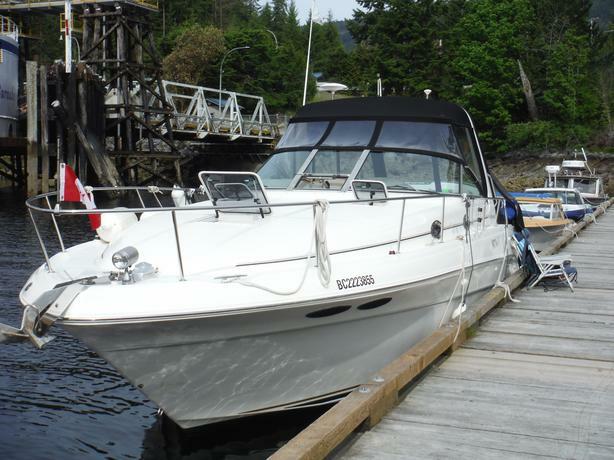 Boat has many features to enjoy and is very seaworthy on the water. We have travelled to some amazing locations in this boat!